A MAME and MESS development blog. One thing I've noticed with growing amazement is the circuitry that people have been laying down in this one game, Minecraft. It turns out that due to the fairly simple rules that are followed by Redstone Dust in the game, you can build all of the necessary logic gates to re-create the inner workings of simple CPUs, ALUs, and other circuits that use binary logic. However, one thing that has consistently bothered me is the lack of any sort of off-the-shelf solution for certain circuits - for example, the initial 16-bit ALU demonstration in Minecraft required the user to read binary, whereas I'm shooting for something a bit more visual. It's with this in mind that I've implemented a working framework for the 7447 BCD-to-7-Segment Decoder IC, which takes four bits as an input and outputs seven lines that can be used to drive seven LEDs (or, in our case, torches) in the standard configuration to form digits. The primary goal with this circuit was to be compact in two ways: First, the ability for the 7447 circuitry to be located entirely underground, and second, and using a minimum of X/Z real estate by building upward rather than outward. In both ways, it was a rousing success. 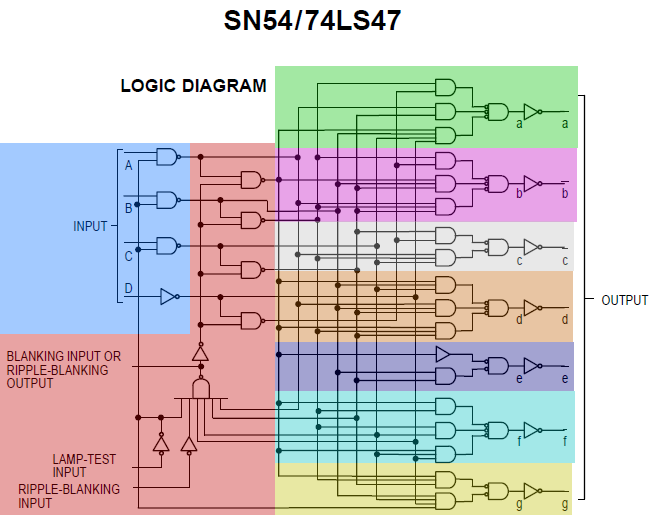 Below is the logic diagram of the 74LS47 chip. It consists of four primary inputs and seven primary outputs, with some glue logic - omitted thus far in the Minecraft implementation due to irrelevance - to control things like output blanking, lamp testing, and so on. - The four red NAND gates were converted to NOT gates. - RBI, RBO, BI and LT are not hooked up due to being relatively irrelevant to the functionality of the chip in Minecraft, though they could be trivially added back in. At any rate, the sky's the limit for what I want to do next. The only real downside is finding datasheets that actually contain a comprehensive logic diagram. The end goal, however, is to begin converting the core functionality from other complex 74-series chips in order to begin building up a library of chips. Stay tuned for a full schematic at some point. How will the CD-i Mono-I peripherals be dumped first? 74LS47, 74LS390, and 7-segment Decoder Complete!